Flies’ multifaceted eyes have long allowed them to elude frustrated swatters from all directions. Now, inspired by insects’ vision, researchers have built a digital camera with an array of tiny lenses lining a bulging eyeball, allowing an undistorted, nearly 180-degree view. The new camera, described in the journal Nature, could one day guide miniature spy planes, search-and-rescue vehicles and even endoscopic procedures. All vertebrate animals (including humans) possess single-lens, rather flat eyes that are great at picking up light and offering high spatial resolution. But unlike vertebrates, most creatures see the world through compound eyes, which use an array of primitive eyes arranged in a highly domed structure that gives them a panoramic view, proving handy for detecting movement and escaping predators from many different directions. 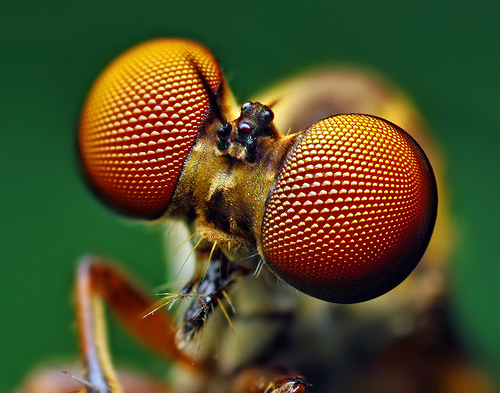 To mimic the fly eye, the researchers took a stretchy layer embedded with 180 lenses, placed it over another layer filled with photodetectors, and essentially blew it up like a balloon. Rigid connections kept the individual lenses firmly attached to their photodetectors while the stretchy material around them allowed the fake eyeball to take the desired shape, giving it about a 160-degree view. The researchers’ mechanical bug eye isn’t yet a top-of-the-line model: It contains 180 lenses, about the same number in the eyes in fire ants and bark beetles, which don’t have great vision. The dragonfly eye, by contrast, contains about 28,000. Fly sized robot takes first flight!